Malpass, who is now Trump’s undersecretary for international affairs at the Treasury Department, has been a sharp critic of the 189-nation World Bank. He has argued that the bank, a lending institution with a focus on emerging countries, has concerned itself too much with its own expansion and not enough with its core missions, like fighting poverty. 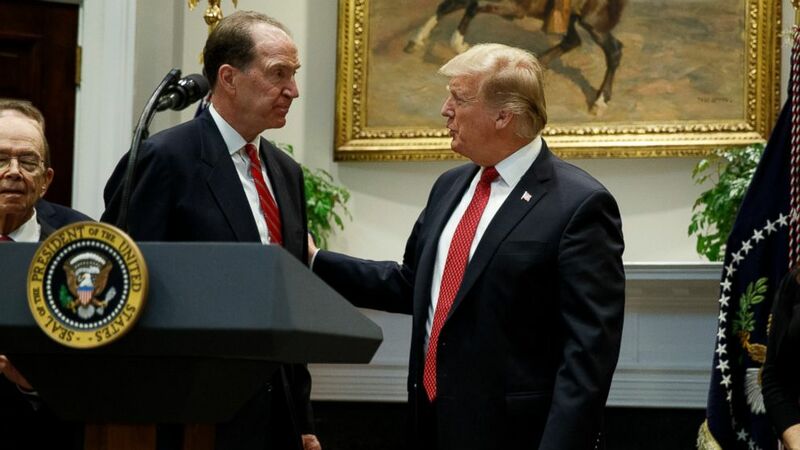 Malpass, 62, made clear Wednesday that his focus at the World Bank would include furthering the Trump administration’s agendas for developing countries. One major initiative, he said, would be to implement changes to the World Bank that he and Treasury Secretary Steven Mnuchin helped negotiate. And in a nod to the president’s daughter and adviser, Ivanka Trump, Malpass said he would focus on improving the status of women. “A key goal will be to ensure that women achieve full participation in developing economies,” Malpass said. “I know Ivanka has been a strong leader on women’s economic empowerment, and I look forward to continuing our work together on her women’s global development and prosperity initiative. Senior administration officials, insisting on anonymity to discuss plans for the World Bank, said Malpass would evaluate bank programs based on such criteria as whether they helped raise median incomes and improved financial transparency. Addressing climate change, which has been a priority for the World Bank, was pointedly not among the benchmarks of success that these officials named, though they said Malpass would honor existing initiatives. Trump, who has been openly skeptical of climate change, announced in 2017 that he was pulling the United States out of the Paris Agreement, an international accord that created a framework for curbing carbon emissions. The officials did not say whether Malpass, who has criticized the World Bank’s lending to China, one of its leading recipients of aid, would aim to curb lending to Beijing. They said that the institution’s priority would be alleviating poverty and that it would be premature to speculate on how its loans might be allocated. Other candidates will likely be nominated for the post by the bank’s member countries. And officially, a final decision on a new president will be up to the bank’s board. But as the largest shareholder in the World Bank, which is based in Washington, the United States has long exerted outsize influence over its leadership.